Difficult to access due to currents in the Pailolo Channel between Molokai and Maui, Fish Bowl offers divers the chance to see white-tip reef sharks on the ledges around 55 feet. Between 40 and 60 feet you'll likely also see eagle rays, octopus, lobster, reef fish, and possibly hammerhead sharks. Over the edge of the bowl are large boulders with coral covering them. Usually used as a drift dive, the strong currents in the Pailolo Channel make this an experienced only scuba trip. At a depth of 80 to 100 feet, Fish Rain is known for its variety of sealife. Divers may see pelagic fish, hammerhead sharks, whale sharks, monk seals, damsel fish, mahi-mahi, and even tiger sharks. Another difficult to access dive due to the wind and currents from the Pailolo Channel, Hole in the Wall is named for the hole above water in the cliff wall in front of the deep enormous pinnacle below. The pinnacle is around 60 feet high with a base at 100 feet down. Divers will see schools of butterfly fish, colorful corals, and moray eels on the top of the pinnacle. In deeper waters, you may see black coral, manta rays, sharks, hawk fish and even whales in the winter season. 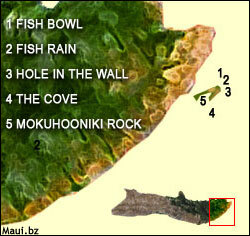 The Cove is a better accessed area to dive off of Molokai. With depths ranging from 20 to 100 feet, the Cove is covered in antler coral trees, butterfly fish, spanish dancers, hawkfish, pelagic fish, lobster, manta rays, and sharks. 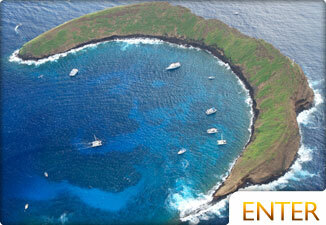 The protected half circle Molokai dive site makes a slope that at 50 feet drops off. 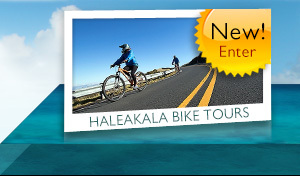 Better known as Elephant Rock, Mokuhooniki is situated in the Pailolo Channel closer to Molokai than to Maui. This area is untouched and offers incredible diving when conditions are right. 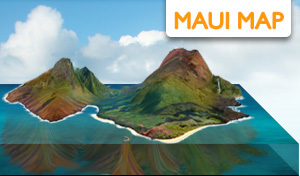 Huge versions of Maui's regular sealife live in this area. If the winds are calm, this is one of the better dive sites in all of Maui County.